We can clear all blocked drains. We use the latest equipment and professional trained workmen. We are West London’s friendliest drainage and plumbing experts and service all areas in and around West London. We offer a professional and comprehensive range of pipe & drain cleaning services for both residential and commercial properties/premises, from Domestic Emergency Plumbing Call Outs to Commercial CCTV Drain Survey’s producing and providing recorded footage and reports of any issues found – No job is too BIG or small for AlfaClear Drains! All your Drainage and Plumbing are in safe hands when you choose AlfaClear Drains’ team of dedicated and fully trained tradesmen. We are dedicated to delivering total customer satisfaction on every job that we carry out and all of our workmen will leave the site as clean and tidy as when they started. To make a booking contact us. We also offer a 24hr emergency service within London’s M25. Drain jetting is an effective way to clear your drains. While you can use drain rods to clear blockages, these sometimes cannot reach the problem, or simply force it further along the pipe. High Pressure Water Jetting can be far more effective as the jetting hose can negotiate bends, travel further down the pipe, and exert more force on any blockage to remove it. We provide Drain Jetting services for London and surrounding areas. 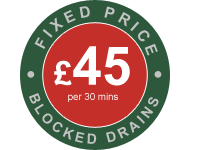 We can quickly identify faults with your Drains and use the latest technology and equipment to ensure that the fix is carried out effectively to leave you with peace of mind. Our team of fully trained engineers are on hand and ready to respond to any of your drain problems you may have. Drain Repairs London and all areas within the M25. contact us now to speak to one of our engineers. In most cases a blocked drain can be cleared manually using our Water Jetting or Electro Rotary tools – CCTV Drain Survey’s are required when a blocked drain becomes more persistent and the issue is more serious. At AlfaClear Drains we use the latest CCTV Survey equipment to determine the root cause of the problem. This includes inserting our digital drainage camera into the drain and making a CCTV recording of the blockage. We can carry out all CCTV drain inspections to any diameter of pipe work ranging between 24mm and 300mm… If you need a CCTV Drain Survey in London please contact us. 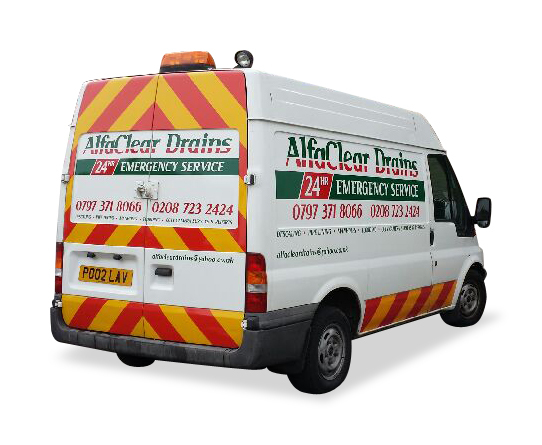 AlfaClear Drains offer a 24/7 Callout for plumbing emergencies. We understand that burst pipes, tap problems, leaks etc can happen at anytime and one of our engineers is always on hand to help. No callout is too big or small – Call 0800 298 0040 now if you have an emergency. Guttering are an essential to your property and need to be maintained regularly to prevent blockages and damage to them and consequently the house. The problem is that most people tend to neglect their guttering due to them being out of site and therefore out of mind. We provide a comprehensive gutter cleaning and repair service for London, Hanwell, Ealing and surrounding areas. If you have blocked or damaged gutters/downpipes then please give us a call and one of our team will be happy to help. All of the work carried out by AlfaClear Drains is fully guaranteed and is carried out by our team of fully trained engineers.